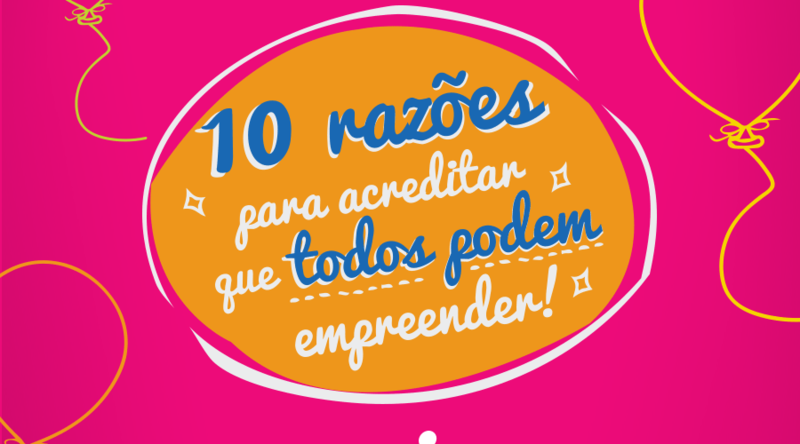 To celebrate the 10th anniversary of “Aliança Empreendedora”, a Brazilian organization who already supported 19 thousand low income microenterpreneurs to develop their businesses, we listed a good sort of reasons in order to deconstruct myths that surround the image that many people have about undertaking a business and become an entrepreneur. Saras D. Sarasvathy, author of “Effectuation – Elements of Entrepreneurial Expertise” (2008), interviewed 52 entrepreneurs from 17 states in the United States, whose revenue varied from US$ 200 million to US$ 6,5 billion, and concluded that entrepreneurs are characterized by certain types of action, rather than inherited personality traits. That means to say that any person is able to learn how to act entrepreneurially, because it is a matter of individual choice and not a natural tendency, a gift or a consequence of the environment to which the person belongs. In addition, the research called “Anatomy of an Entrepreneur”, conducted by Kaufmann Foundation, found that 52% of successful entrepreneurs are the first ones in their families to start a business. Among these successful cases are Bill Gates (Microsoft), Jeff Bezos (Amazon), and Larry Page and Sergei Brin (Google). The research made by Saras D. Sarasvathy also concluded that expert entrepreneurs base their decisions on five principles. The first one is “The Bird-in-hand principle”: in order to start a new venture, it is necessary to focus on the means instead of on the objective. This means that instead of defining a goal and searching for investment in order to reach it, expert entrepreneurs analyze the resources that they already have at their disposal or that they can obtain through their network and, from that, they develop one or more business ideas. This approach also enables the entrepreneur to not rely on large loans or get into debts at the beginning of the new venture, which is always the most challenging time for an entrepreneur. So, at first, the entrepreneur will only risk what he/she can lose, and as time goes by, he/she will learn how to take greater risks in the future. This attitude describes the second principle listed by Sarasvathy: “The Affordable Loss principle”. According to the research “Brazilian entrepreneurs: profile and perceptions” (Endeavor and IBGE, 2013), many Brazilians list lack of financial resources as one of the main reasons not to start a new venture. How about, instead of focusing on the lack of money, thinking about making that great idea come true by starting with what you have at hand? Global Entrepreneurship 2014’s executive report, which places Brazil as first in the global entrepreneurship rank, shows that, in Brazil, most of the already established entrepreneurs did not finish high school. Kaufmann Foundation has extensively researched how education may help entrepreneurs to grow and understands that the best moment to capacitate them is when they are starting a business or planning an expansion of an existing venture. According to the article “Can Entrepreneurs Be Made?”, by Vivek Wadhwa, this means that “what entrepreneurs need isn’t the type of abstract course they teach in business schools, but practical, relevant knowledge”. Nowadays, this type of knowledge is not part of the curriculum of most Brazilian universities. If you starting a new venture or planning on making changes in a working business, have you thought about searching for support in your region? According to Sebrae, 99% of the Brazilian businesses – which means to say 8.9 million businesses – are micro or small companies that are responsible for creating 52% work positions in the country. They also represent 40% of the wages paid in Brazil and are responsible for generating 27% of the internal GDP. In other words, micro and small businesses have an enormous impact in our country’s economy and we barely take notice of that. When you think about successful entrepreneurs, what names come to your mind? Many Brazilians still associate success to the size or the revenue of a business. However, the idea of success varies from one person to another and it has to do with each person’s dreams. Many people do not dream of having big businesses but rather of having their own businesses, even if small. As long as they’re are well developed and showing good results. This is also success. Now, when you think of successful entrepreneurs, how about remembering those entrepreneurs that make a great difference in the trade of your region? Before succeeding in creating the light bulb, Thomas Edison went through ten thousand prototypes. Colonel Sanders, founder of KFC, tried to sell his recipe of fried chicken to 1009 restaurants before actually finding a customer and Richard Brandson founded 400 companies before establishing the successful Virgin as it is today. There are many stories like this: Henry Ford, Walt Disney, Oprah Winfrey and even J.K. Rowling failed before reaching success. What do these stories have in common? Saravasthy listed “The Lemonade principle” as the fourth the guide expert entrepreneurs. According to the author, more important than failure itself is learning how to manage it and how to use it favoring the business and the entrepreneur’s development as an entrepreneur. This principle suggests that interventions be recognized and appropriated, taking advantage of surprises instead of trying to avoid them, overcome them or adapt to them. In short, “The Lemonade principle” is the ability to transform the unexpected into value or profitability, that is, taking seriously the expression: “If life hands you lemons, make a lemonade”. Eric Ries, in his book “Lean Startup”, states that mistakes are beneficial to the development process of a new business. However, he says that it is important to fail as soon as possible and to learn as quickly as possible! In other words, entrepreneurs should keep their failures small and should also eliminate them while they are not creating bigger problems. What do you say: how many times are you willing to try? If you look for the word “entrepreneur” in the dictionary, you might find a definition similar to this: 1. The one that starts new ventures. 2. The one that adventures in accomplishing hard or unusual things (Michaelis). The concept of entrepreneurship is a broad one and starting your own business is only one way of becoming an entrepreneur. For example, you may have an idea that would solve a social problem and impact society positively, that is, you may be a social or civic entrepreneur; you may start a project inside the company you work at or maybe create a new way of executing some tasks, that is, you may be an intrapreneur or a corporate entrepreneur. You may even act within your social circle (school, community, neighborhood, church, family, university) to start new things or projects. Even “debt” is heavy word, especially when you talk about making debts to pay for everyday expenditures (credit cards, personal loans, etc), whenever a debt is the result of a well-planned loan that will be used in order to increase a business’ revenue, then it is vital for the business’ development. Many microentrepreneurs are so afraid of acquiring debts that rule out that alternative before even thinking about how it could help the company grow or overcome a challenging moment. One of the entrepreneurs supported by Aliança Empreendedora, Edinaldo Souza, owns a bike shop located in the metropolitan area of Curitiba (south of Brazil). He started his business with little money and knowledge and, since he didn’t have working capital in order to stock the supplies he needed to fix bicycles, whenever a new bike came in, he would go to the suppliers to buy the parts he needed. In order make his business grow, Edinaldo lent around R$ 1 thousand (US$ 350), which allowed him to buy more parts at a better price. That, in turn, made him save time because he didn’t have to go to the suppliers as frequently. In other words, his business was immediately affected by the loan. Once again: Saras D. Sarasvathy! During her research, she found out that expert entrepreneurs do not start their ventures writing up a business plan (a document about the chances of success of a business written based on research and projections for the future), as it is taught at business schools. This means to say that the entrepreneurs do not look for a “good opportunity” to start a venture, according to pre-existing market parameters. Saras says that, in reality, expert entrepreneurs do not believe in market research. They actually believe that the future is driven by human action, which is intrinsically unpredictable and not measurable. Therefore, they prefer to try to control and model the future instead of predicting it with studies and researches. In short, the entrepreneurs develops his business from the moment he decides to become an entrepreneur and redefines objectives and business models according to the feedback he gets from the market. For that reason, successful entrepreneurs are, mostly, innovators. They create businesses that meet needs we couldn’t even predict we would have one day. Wait a second… the business plan doesn’t work? Yes, it does, but mostly as a good auxiliary planning tool. Because of Sarasvathy’s study, we know today that the success of a business is not only and exclusively related to how good the business plan is. Sarasvathy’s study shows that expert entrepreneurs overcome uncertainty by treating unexpected events as opportunities to exercise their control when faced with emergencies. In order to maintain a successful business for a long period of time the entrepreneur must overcome failures, collect successes and learn from both situations. The expert entrepreneur knows that it is impossible to predict the future, so he/she does not spend energy on that. He/she knows that what happens tomorrow may depend mostly on his/her own actions, and he/she sees the market as a network of people that may be influenced, not as something distant or static. It is as if, instead of counting on their chickens before they hatch, the expert entrepreneur decided that it was best to sit down by the eggs and keep them warm, so that healthy chickens hatch from them. Who I am: entrepreneurial qualities, biography, preferences, passions, etc. Therefore, one of the essential points made by Sarasvathy is that businesses should be related to the entrepreneur’s likes and passions, instead of being something with which he/she cannot relate. In this case, it is essential that the entrepreneur is not only passionate about something, but also curious about an area, studying it vigorously. After all, technique and experience will make a difference when they go from theory to practice. from Luísa Bonin – Communication Director and Caroline Appel – Development and Research Director of Aliança Empreendedora.